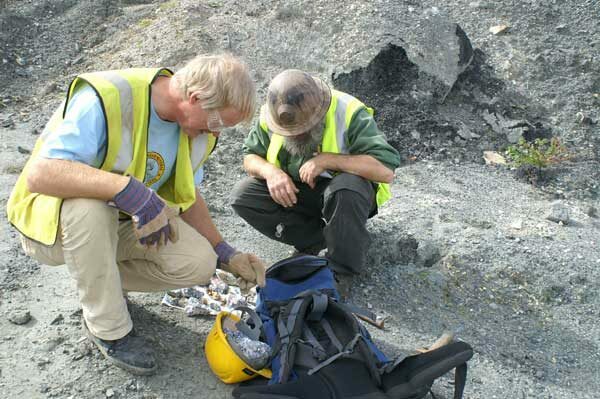 Ross Whittaker wearing safety glasses and Neil Plummer,on the right with South Crofty hard hat in the safety area of Greystones Quarry, examining Copper and Lead secondary minerals. The collected specimens were being wrapped and sorted in the safe area,that was put aside by the quarry company. Ocassionally this is turned over, but even better good news is that it is also replenished by the company from the Galena and Lead secondary lodes exposed within the quarry. This was a joint Field Meeting of members of the Cheltenham Mineral Club and the Royal Geological Society of Cornwall. Joint Cheltenham Geology Club and the RGSC carefully negotiate very large boulders in the Safe ! area of the quarry ! As the Safety officer they were advised by me that such large stones can be balanced and can move!-without warning ! The RGSC has a 100% safety record which I intend to keep. Risk assessments are carried out on all sites and field events by appointed safety officers. ALL INSTRUCTIONS FROM FIELD EVENT LEADERS MUST BE FOLLOWED AS A REQUIREMENT OF TAKING PART. 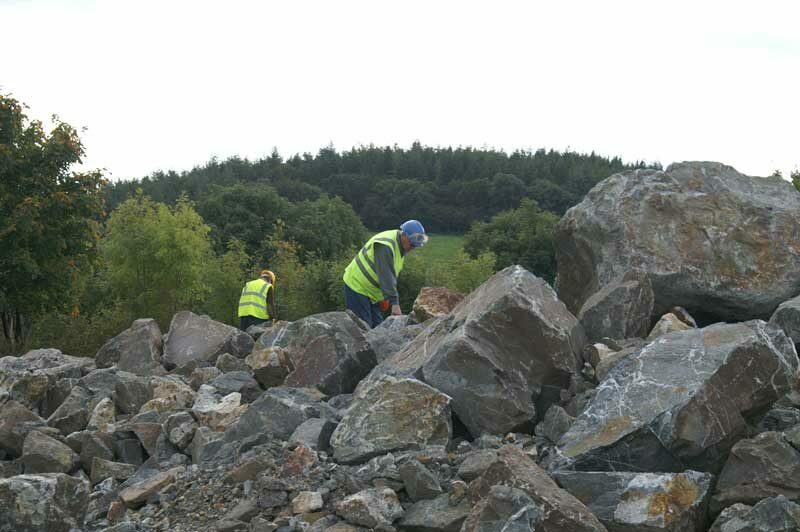 Special attention is needed for overhanging rocks and large boulders and rocks that can slip and move! Quarries also often have large areas of muddy poisonous lakes and standing water often not obvious. NO ONE WILL BE ALLOWED NEAR ANY OVERHANGING ROCKS. EQUIPEMENT.Hard Hats,Safety Glasses,Gloves,Hard Boots,and highly visible tabards and coats must be used,at all times in active quarry sites. The leader's advice must be followed:No equipment-MEANS NO ENTRY.!!!! Geology can still be enjoyed by all but in the safest possible way. 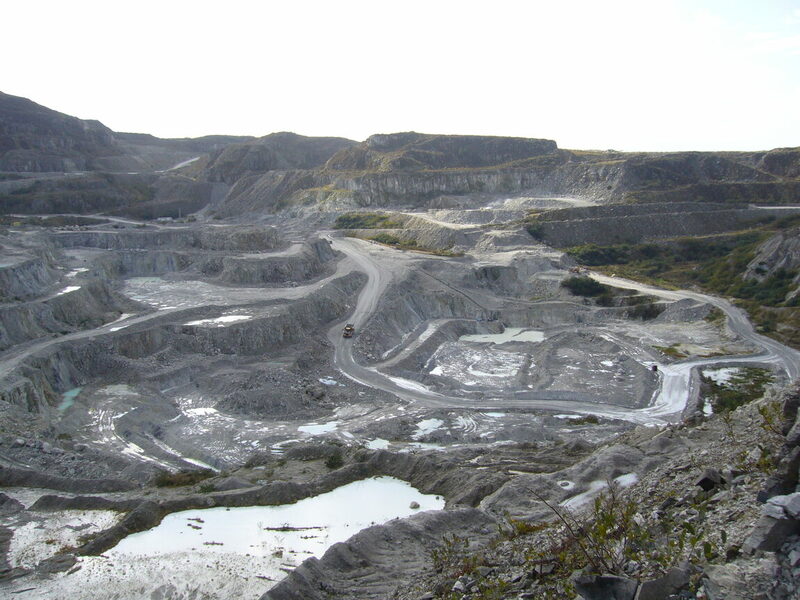 LITTLE JOHNS QUARRY WITHIN THE CHINA CLAY DISTRICT OF ST.AUSTELL,CORNWALL.The site was visited by the Society in 2015 and shows the vast size of the extraction process and a great necessity to follow the leader's advice,to avoid soft ground,overhanging areas,other areas prone to slippage,static clay filled ponds and lakes,heavy vehicles and all hazards identified by the leader of the group. A wonderful experience was held by all.Several of our members work within the Industry. Please note the highest levels of the surrounding land which represent as near as possible the natural original surfaces of the landscape which existed before the Clay pit was developed! The use of a "swiss army knife" is often used to show scale of rock matrix. 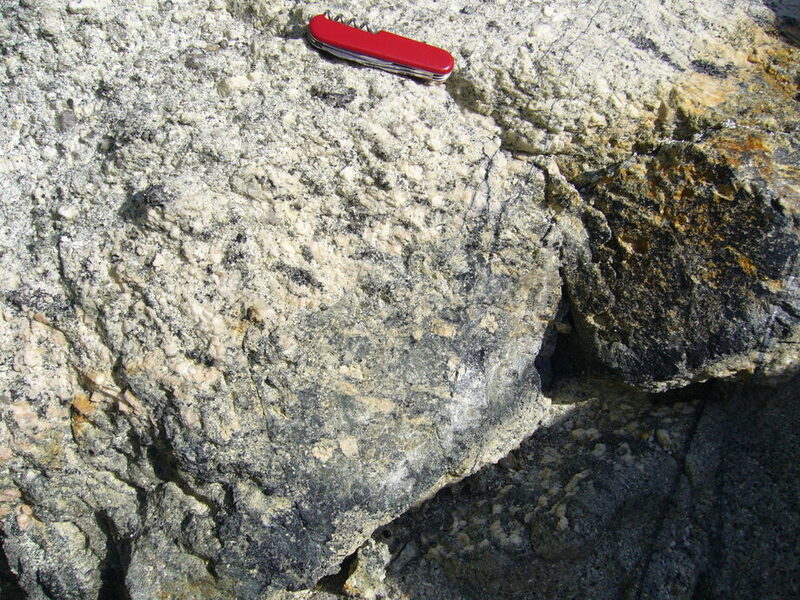 and crystal sizes.Here we see a highly altered Kaolinised Granite with minor iron staining and Tourmalised veins showing different phased stages of pneumatolysis of St.Austell Granites in parallel structures.Note the phenocrysts /crystals of kaolinised and partially kaolinised feldpars. 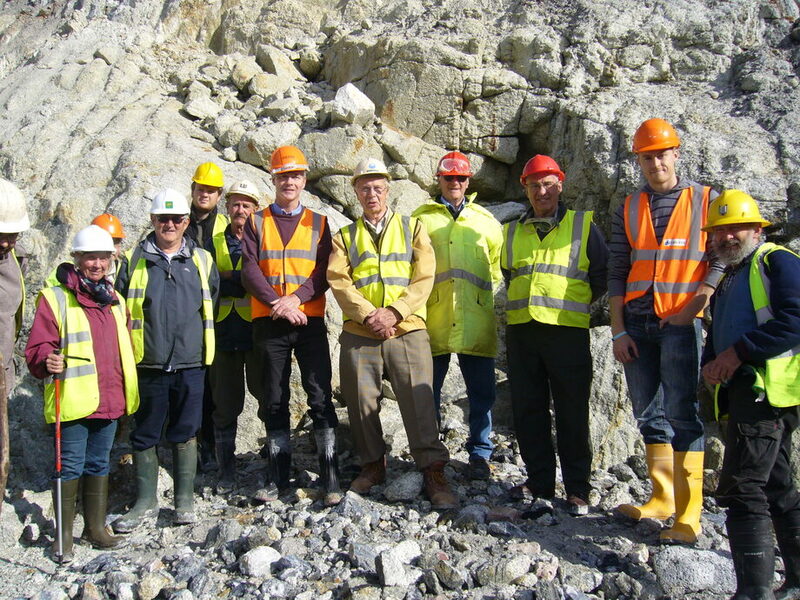 Royal Geological Society Members on our vist to Littlejohns China Clay Pit.Mine Manager Paddy Bristow and Professor Colin Bristow are 7th and 8th from the left.Highly visible coloured hard hats,tabards and Capped Miners boots are essential for everyone entering working clay pits. Note the jointing and rounded blocks of the granite in the background. Members no doubt will be able to pick themselves out in the photo.Does anyone recognize the one on the right?